Iconography and Iconology. Art Terms at Biddington's. Iconography is the study of symbols depicted in a work of art. Traditionally, these symbols derive from a readily recognizable, common currency of cultural or religious experience. For instance, in Western culture, a cross is a familiar shorthand symbol for Christianity and an obelisk is a generally understood emblem of dominance. Iconology is the study of the meaning contained within the symbols in a particular work of art. For example, Caravaggio painted several martyred saints. But the figure crucified upside-down is a reference to St. Peter who, claiming himself unworthy to die in the same manner as Jesus, opted for the head-down position. So, in this particular painting the cross refers not only to Christianity but to humility as well. An obelisk such as the Washington monument is a reverent--if prosaic--symbol of patriarchy. As a protest to Vietnam, Claes Oldenburg in his Pop sculpture Lipstick transformed the obelisk into a deflatable, brutally absurd instrument of war. Iconology examines the symbol on more than its face value and finds meaning by reconciling it with its historical context and with the artist's body of work. Why bother with all this symbolism and subtext? The use of symbols allows the artist to pack a lot of information into a small space. Also, it gives the artist the flexibility to allude to some piece of personal or shared myth in a minor way--to refer to something that is meaningful to the artist but that may not merit an entire work of art. For instance, Diego Rivera chose the self-fruitful calla lily as the symbol for Frieda Kahlo and used it extensively in his work. Even though Frieda's face or figure is absent, her presence is still acknowledged. Left: Fantasy painter Gary Slipper makes works rich in Christian and pagan iconography. 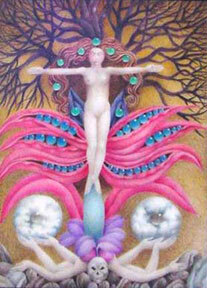 Adolescence (left) refers to the Druidic image of the sacred tree as a cosmic axis. Can I enjoy a work of art without understanding all the references? Unless an artwork makes visual sense, peeling the layers of meaning in its iconography and iconology is pointless. But in a fine painting, appreciating its symbolic implications can make viewing it even more engaging. In a few sublime instances, art transcends culture and time and all requirements for explanation. But in studying most art objects produced in a distant era or faraway country, knowledge of iconographic shorthand is a useful tool.